← Singing the Nganasan bear dance song in Hamburg. Roza Laptander and Stephan Dudeck from the Anthropology Research Team in Rovaniemi participated in the Franco-German seminar “Gateway to the Arctic” from 17th -19th September in Bremerhaven. 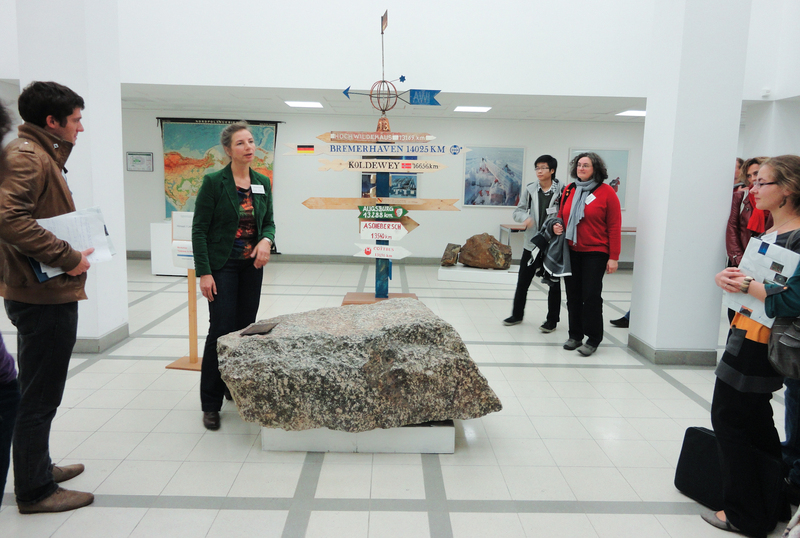 It aimed at enabling the dialogue of natural and social scientists in Arctic research. Roza Laptander presented a poster about the snow terminology in Nenets language and the traditional environmental knowledge of tundra nomads in the Arctic. 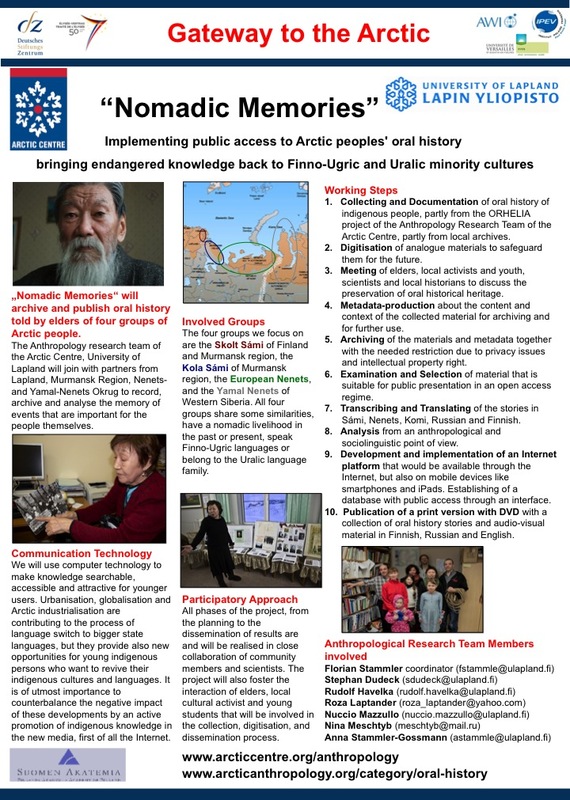 The poster of Stephan Dudeck presented the planned project of the Anthropological Research Team “Nomadic Memories” – Implementing public access to Arctic peoples’ oral history – bringing endangered knowledge back to Finno-Ugric and Uralic minority cultures. 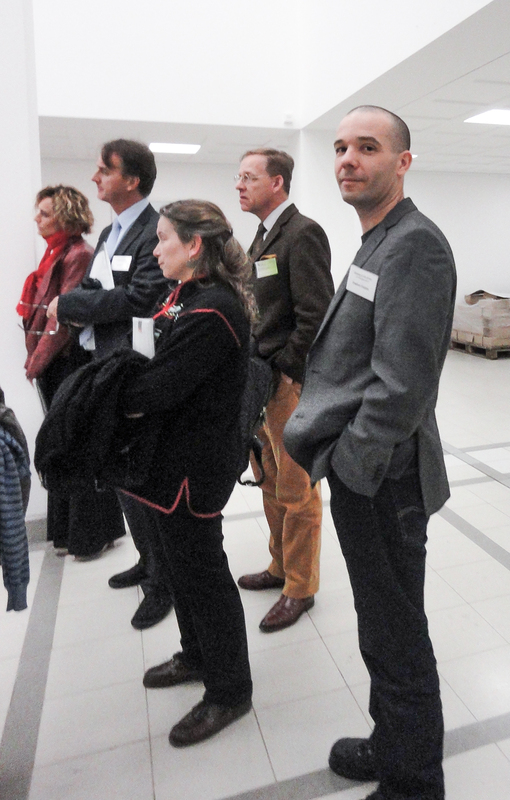 The seminar took place at the Alfred Wegener Institute for Polar and Marine Research (AWI) and was organised in collaboration with the French Polar Institute (Institute Polaire Francais – IPEV) and the European Centre for the Arctic (CEARC) at the University of Versailles Saint-Quentin-en-Yvelines. Natural science and social science research in the Arctic is carried out together at these French institutions but real multidisciplinary and joint research agendas are still rare. For the Alfred Wegener Institute the social sciences are a new territory even if natural scientists are well aware of the consequences of their research for the life of Arctic inhabitants and especially indigenous people, as Prof. Hans-Wolfgang Hubberten the Head of AWI Research Unit Potsdam stated. Particularly in the so much important research on climate change in the Arctic the importance of juridical and economical circumstances as well as the consequences for human inhabitants are more than obvious for natural scientists, who search to understand the natural processes in the Arctic environment, as was stressed by Renate Treffeisen, the main organiser of the seminar from the AWI Bremerhaven. At the moment there are only a few and quite dispersed social scientists in Germany, most of them in the Siberian Studies Centre of the Max-Planck Institute for Social Anthropology in Halle/Saale, who do research in the Arctic. Collaboration with natural scientists, who have much bigger resources and an impressive infrastructure at hand, could be very beneficial for social science researchers but also for local communities and indigenous partners, social scientists are working with. Precondition for a fruitful multidisciplinary research is of course that social scientists don’t feel reduced to a pure attachment of environmental studies as the “human dimension” or worse if they feel together with indigenous informants to be used just as guides, door openers and interpreters for researchers who are interested in the live of Arctic inhabitants only so far as it concerns their scientific research. Another serious obstacle is of course the difference in research methodologies and different epistemologies used in the research. As we learned during the discussion, natural researchers are much more self-reflexive and aware of the pitfalls of positivistic approaches than social scientists suspect. A more holistic view on the interplay of political, economical and natural phenomena is necessary especially in the Arctic, where human live is so dependent on nature and nature so vulnerable. As anthropologists we know that often we lack an adequate understanding of the highly specialised knowledge of our informants in the Arctic. We are missing environmental knowledge about weather phenomena or the biology of animals and plants in the Arctic. We are unable to grasp how much the Arctic inhabitants know about the ecosystems and cultural landscapes they are part of, because we can’t translate their knowledge in our own languages. Collaboration with natural scientists could provide us with instruments to become seeing in that blind spot. We as anthropologist at the opposite could provide the instruments to understand the different forms of environmental knowledge and how they and the epistemologies they are based on are embedded in social and political contexts. Indigenous people are often quite aware of the fact that the abilities, instruments and perspectives to look at and understand the world of different groups of people (and in general all beings) differ a lot but have to be respected and judged on their own merits. It was refreshing to see that natural scientists start to recognise the highly developed forms of empirical knowledge inhabitants of the Arctic have and their farewell to the hierarchical epistemologies that place insights derived by western science on top of the development of knowledge. But I should not hide the fact that there is not yet so much interdisciplinary research at least in Germany and France. The only exception was probably Alexandra Lavrilliers research from the CEARC about the way Evenk and Even people in Siberia observe changes in the climate and how these knowledge is embedded in the social and religious universe of the reindeer herders, hunters, and fishermen. The rest of the talks and posters presented served at least the purpose of getting to know better each other’s research agendas in arctic research. This is all the more astonishing as the strong division between the humanities and the natural sciences in Arctic research is something quite new in the history of science, as was mentioned several times during the seminar. Prof. Günther Lottes from the University of Potsdam for instance spoke in his talk about Pierre-Louis Moreau de Maupertuis, the French mathematician and Lapland traveller who became the first president of the Prussian Academy of Sciences in the 18th century. Concrete suggestions about joint research in the Arctic were rare. Before this background it was all the more surprising when a colleague from the geochemistry asked Roza Laptanders who did research on Nenets knowledge about the phenomenology and terminology of snow if she could imagine a joint field-research about the different manifestations of snow. The need to continue the discussion for the search of possible multidisciplinary research themes and a further understanding of scientific methods used in research was stressed by Jan Borm, the director of the CEARC. A seminar organised by the French Polar Institute (IPEV) will therefore follow next year in the French city of Brest to continue the initiated dialogue. The talks of the director of the AWI Prof. Karin Lochte and the Head of the AWI Research Unit Potsdam Prof. Hans-Wolfgang Hubberten who took very active part in the discussions gives reason to hope that the institute will foster the dialogue and multidisciplinary projects between social and natural sciences in the future. This entry was posted in All, Announcements, Fieldwork, Indigenous Peoples, oral history, Russian North, Theoretical Issues and tagged Anthropology of the North, Arctic Natural Sciences, Arctic Social Sciences, Climate change, conference, indigenous people, Uralic languages. Bookmark the permalink.